Using warm oil, vital energy points (marmas) and chakras are stimulated to provide a deeply relaxing and energising massage. Pindaswed improves circulation and loosens toxins; reduces water retention, swelling and excess fat tissue; stimulates lymphatic drainage; and relieves muscle and joint pain. This specialised massage involves the therapeutic application of heat by a bolus filled with warm herbs, which is massaged either over the whole body and/or around particular joints or areas of pain. The gentle penetration of warmth into the body also makes this treatment a very relaxing and soothing experience. Full body (1 hour 30 mins). Please note there is a one-off charge of £15 to prepare the Pindaswed boluses (these can usually be used for 3 months). 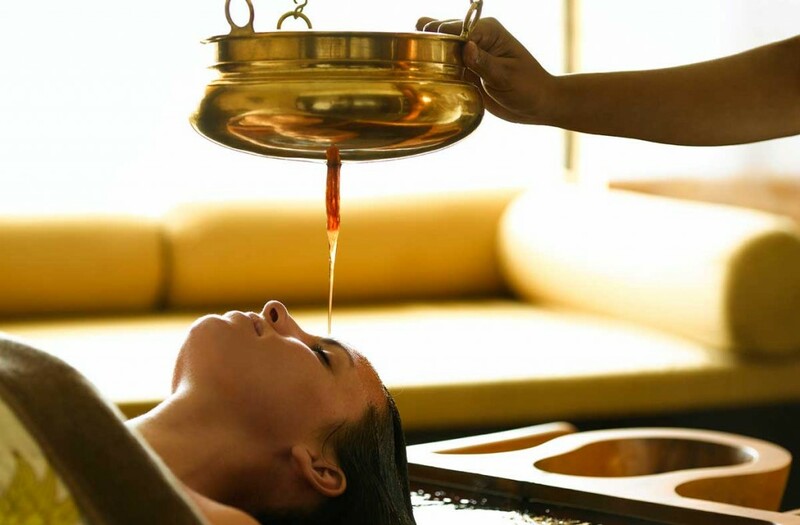 Shirodhara involves the pouring of warm, medicated oil in a continuous stream across the forehead. This incredibly relaxing treatment will help to relieve tension, anxiety, insomnia and headache. It reduces high blood pressure, improves concentration and mental clarity, and promotes hormonal balance. The treatment finishes with a gentle head and neck massage. Please note there is an initial charge of £5 for the oil (this covers up to 3 sessions). This treatment, which is based on the Dorn Breuss method, focuses on realignment of the spine. It is very gentle, yet deeply relaxing. One treatment can bring immediate relief; a series of treatments may be needed for lasting results. This treatment involves the pouring of warm medicated oils and decoction over the heart area, producing deep relaxation. Heart dhara can help to relieve anxiety and fear and produce a calm, grounded feeling. It is also a supportive treatment for high blood pressure, and various heart conditions. This massage helps to relieve tension and has a calming and balancing effect on the nervous system, as stimulation of the marmas (vital energy points) in the head affects the hypothalamus and pituatary glands which are responsible for balancing hormones and maintaining homeostasis in the body. Concessionary appointments are available at certain times. Please contact Julie for details. Click here to book a Treatment and start to transform your life!